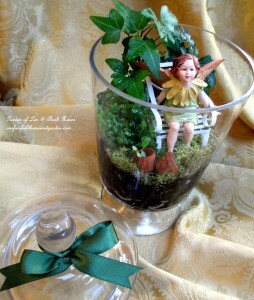 Home » Bringing the garden inside » DIY Project ~ Summer Enchantment in a Jar! 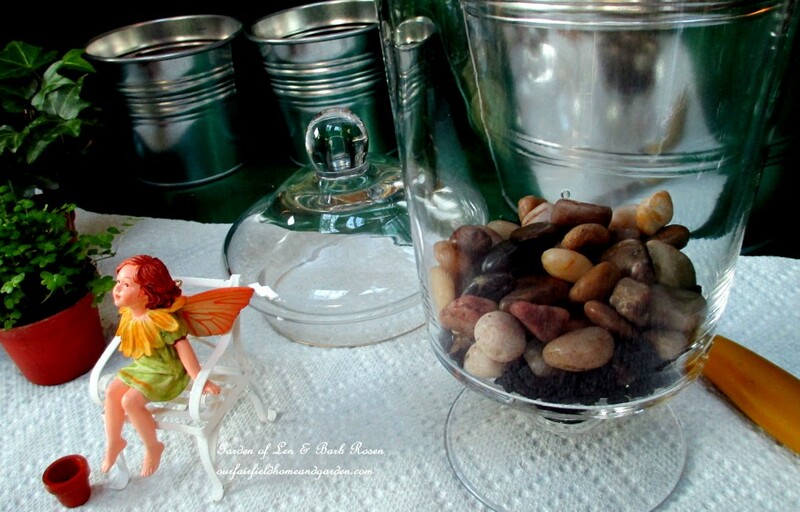 DIY Project ~ Summer Enchantment in a Jar! Summer enchantment in a jar! A dear friend and fellow gardener has her birthday in mid-February when there’s nothing happening in our gardens. 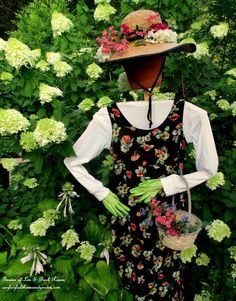 Like me, she is longing for better weather and being outdoors with green plants all around. So, this year, I decided to make a tiny jar of summer enchantment to carry her through until spring! Follow these easy steps to make your own little bit of summer enchantment to chase those winter blues away. 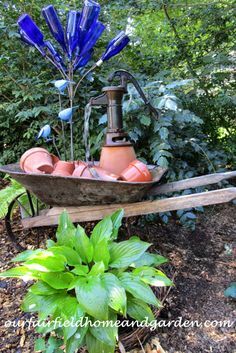 When the big garden is sleeping, planting a little one will help keep that gardener’s itch at bay. 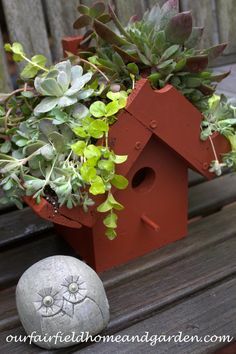 Assemble your materials : pebbles, activated charcoal, potting soil, tiny ivy & fern plants, dried or live moss, a glass container and accents. Put the charcoal and pebbles in first to provide drainage. 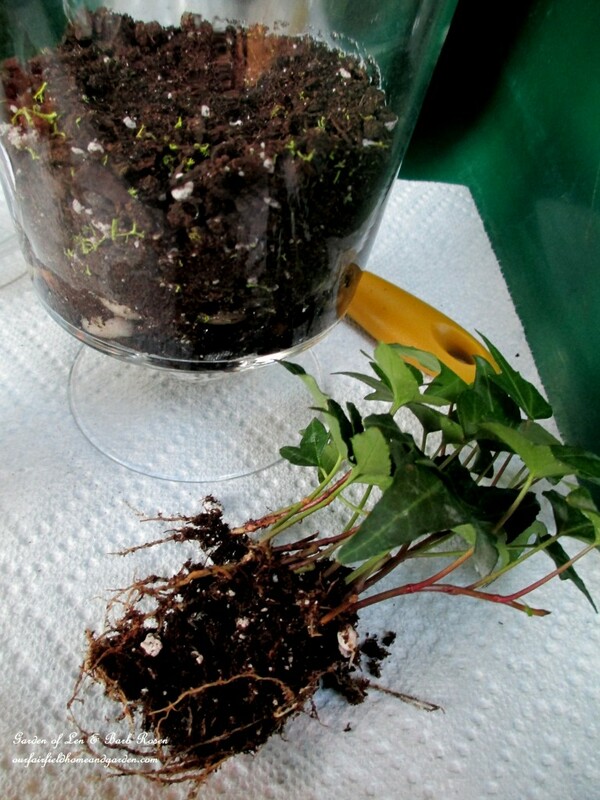 Trim the plant roots to about one-third their original size before planting in the terrarium. 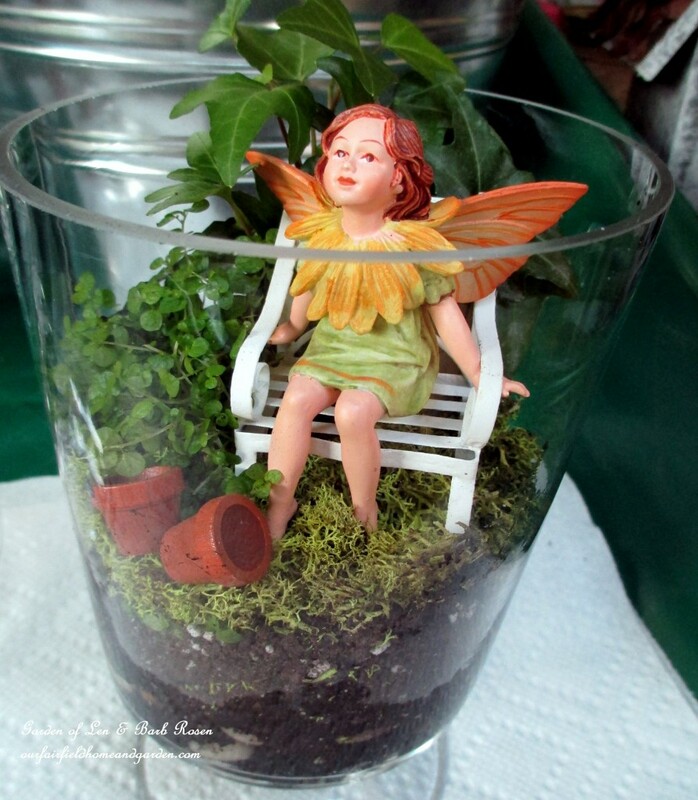 After planting and watering in your plants, add dried or fresh moss and little accents like a seated fairy and tiny clay pots. This tiny fairy and her garden are ready to be a birthday gift for my friend! 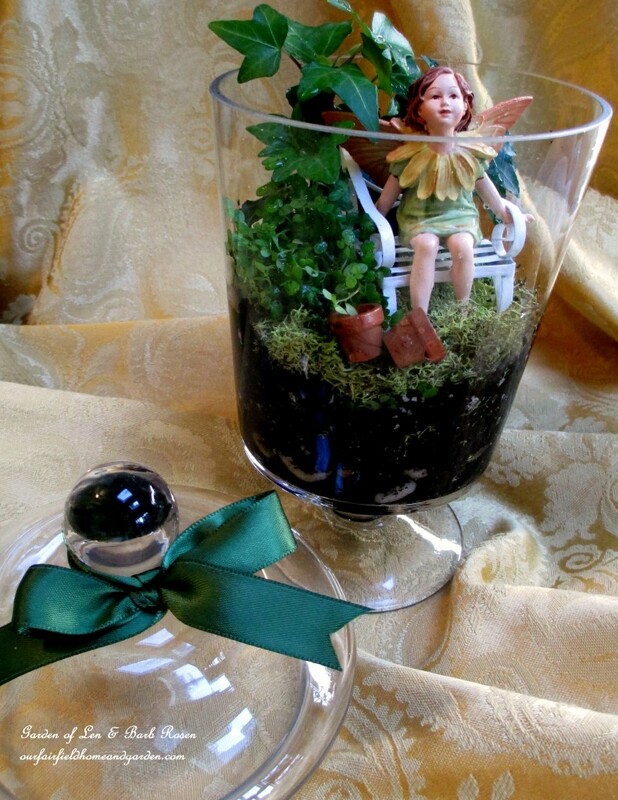 This fairy garden can be gift for this coming Valentine’s Day…..
Actually, my friend’s birthday is on February 10th and it will be her gift. But his would make a wonderful Valentine’s Day present as well, Emma ! Do you have to have a cover for the jar ? 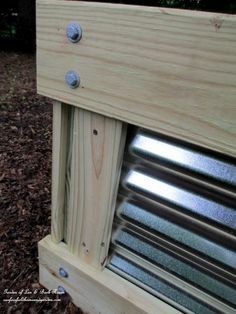 Will the plants grow without a cover ? Hi, Edith! The plants grow very well without a cover and many terrariums don’t have one. You just have to monitor the water needs a little more often than with a covered jar. Try reusing all sorts of jars, vases, candy dishes etc. to make your terrariums inexpensively. I HAD a terrarium about 2 years ago, and you’ve inspired me to try it again..Where did you get the little girl figure, bench & pots? It’s adorable!! 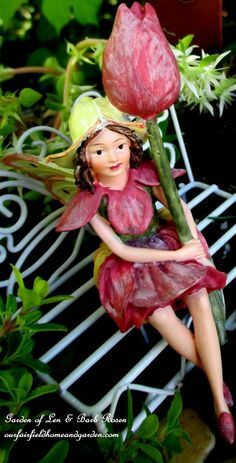 The flower fairy is a Cicely Mary Barker (illustrator) reproduction and you can get them on-line at many locations (just google her name!). The little seat and pots I have had for some time picked up at some shop or other, can’t quite remember now. So pleased that you enjoyed my little garden and are making another of your own, Karen! Such a sweet gift for your friend! I love making terrariums, any indoor gardening is a passion. 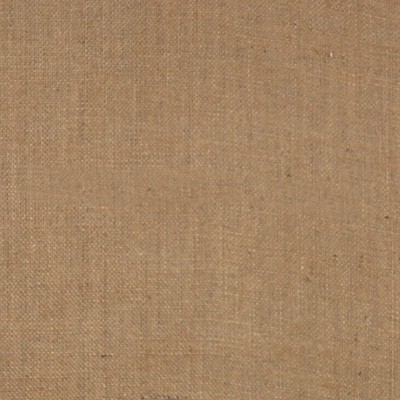 I dropped by from Hometalk, and am now following you. You have a lovely site. So glad you came by today, Debbie! Thanks for your kind words and following me too. Indoor plants are my focus right now because of the winter season, but I am chafing at the bit to get outside! Hope you’ll be a frequent guest ! 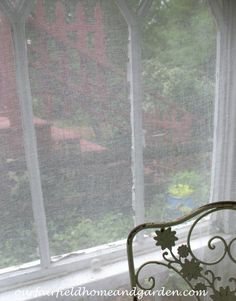 Our Fairfield Home & Garden - Seasonal flowers, gardening and DIY projects.